Enzymes are large molecules made from many amino acids. The amino acids link together in a long chain, that is folded up into a complex structure. Enzymes have a region that holds the substrate: a claw, cleft, hollow or knob to grasp, hold, stretch and bend the molecule it acts on the substrate. 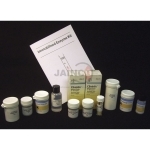 Jainco is the leading in Enzyme Equipments Manufacturer, Enzyme Equipments, Enzyme Equipments Suppliers, Enzyme Equipments in India, Enzyme Equipments Exporters in India, Enzyme Equipments Suppliers in India, Enzyme Equipments Manufacturer in India. 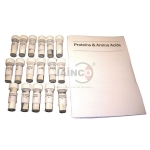 The kit contains worksheets and guides and is based on the determination of amino acid structures by their hydrolysis and subsequent chromatographic separation. 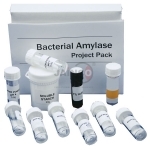 Bacterial Amylase Project Pack The kit contains the enzyme, starch, iodine and all buffers necessary to carry out experiments into the effect of pH and temperature on Bacterial Amylase. This kit is designed for 10 groups of students to use. The kits comes complete with guides and worksheets. The ancient art of cheesemaking provides a perfect example of how biotechnology can be used to improve a process and its end-product. 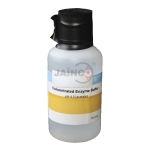 Enzyme buffer solutions are presented as 50ml concentrates in handy storage bottles. 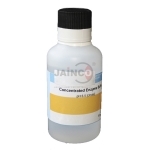 These buffers are meticulously prepared by experienced technicians working in clean laboratory production facilities. This kit allows for an excellent set of activities studying the effect of temperature on enzyme activity. This kit is designed for 10 groups of students to use. The kits come complete with teachers guides and worksheets. 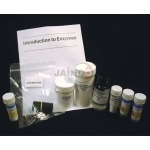 Demonstrates the effects of pH and temperature and the specificity of enzymes. Enzymes should be stored in a refrigerator at 4oC. This should ensure a shelf life of up to 12 months. Enzymes should be stored in a refrigerator at 4oC to ensure a shelf life of up to 12 months.